You may want to make a substantial gift to Regis College in the form of appreciated securities or cash, but perhaps you are hesitant to give up the steady dividend income that you are receiving. If so, you may want to consider our life income plans. Investing in a life income gift often provides a significant increase in annual income when compared to the income earned in a savings account or from current dividends. By planning the form and timing of gifts, you may find that you can make a gift while retaining personal security. 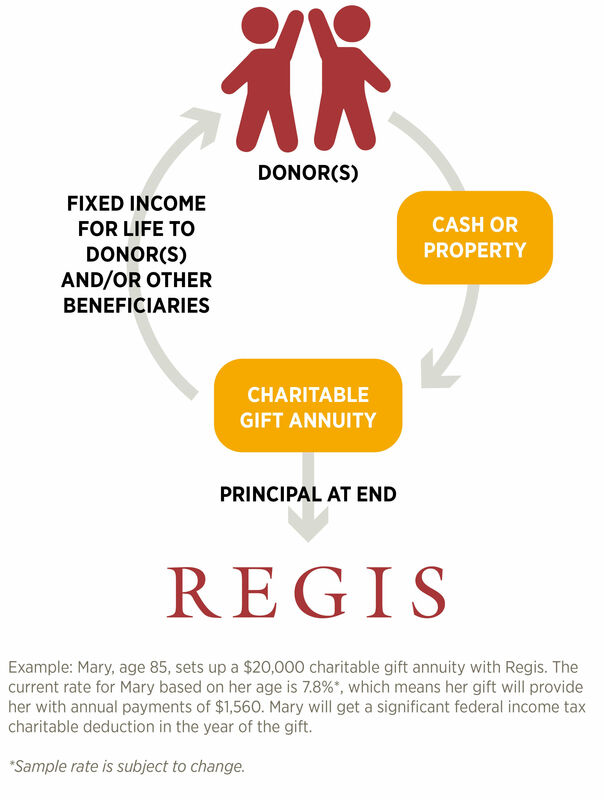 A charitable gift annuity is a simple agreement that allows you to make a gift to Regis College while receiving income and tax benefits. In return for your gift, you and/or spouse will receive fixed payments from Regis College for your lifetime(s). The income payments are based upon the age(s) of the income recipients and IRS discount rate at the time the gift is made. • To receive a sample projection of how a charitable gift annuity may be beneficial to you, please call 781-768-7220. Charitable Trusts allow you to provide a gift to Regis College while meeting your specific needs. These types of Trusts combine charitable giving with other financial goals. Income is paid to you or your spouse for life or to another beneficiary for up to 20 years. When the Trust term ends, the principal remaining in the Trust (the charitable remainder) becomes a gift to the College. Charitable Trusts also bring tax benefits because they result in gifts – exact tax deductions depend on a variety of factors, including length of Trust and the amount of income paid to beneficiaries.